Economical rooms an outdoor pool Wi-Fi and a restaurant are welcome features at Americas Best Value Inn - Florence which has a handy location off I-95.. Americas Best Value Inn has two floors with exterior corridors. The 96 rooms some non-smoking include Wi-Fi cable TV and free local calls. Brew yourself some coffee before starting the day with the continental breakfast at the hotel restaurant. Relax in the seasonal outdoor pool before meeting friends at the bar and grill or indulge with room service. The laundry facility helps guests look their best and copy and fax services help business guests finish work. Outdoor parking is available and pets are allowed for a fee. 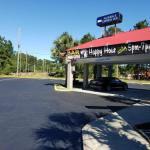 Americas Best Value Inn is directly off I-95 in Florence. Head five miles south into town for restaurants and the Amtrak station or shop at the Magnolia Mall 15 minutes away. Take in a show at the Florence Little Theatre or wander through the Florence Museum of Art both 15 minutes from the motel. The races at Darlington are 25 minutes away. Florence Regional Airport nine is miles away and Charlotte/Douglas International Airport is 112 miles from the hotel.